I found it fascinating that when I talked about my adventures in the world of knitting color, dozens and dozens of you wrote to say that you learned color in the context of quilting. Guess what? Years ago, I was a dedicated quilter, with a huge fabric stash and the whole shebang. Granted, my quilts were not the color showpieces you might see in Quilting Arts magzine. Most of my quilts were (loosely…) based on Amish quilts, with their "plain," rich colors. Those Amish colors are also echoed in all of my crafts. So, when I sat down to finish my self-imposed assignment: "Design a Fair Isle swatch using only the random balls of yarn found whilst packing," I sat down with our Color Works book and started with what I knew. Many of the Amish quilts I've seen are blue-based; thus, I began with the Blue Hue section of the color wheel. I would have been completely lost at this point (yes, at the beginning…) until I remembered a conversation I'd had with Eunny Jang about her Venezia sweater (featured in the Knits Winter 2006 issue and available for download!) I had asked her (begged her, really) to help me understand how to select colors and here's what she said: "Pick two color families (hues). Then pick three variations of each–dark, medium, light. Now you have six colors that go together beautifully!" I was dubious. Maybe they would go together beautifully if chosen by Eunny; I wasn't so sure about anything chosen by me. Nevertheless: We are Fearless, and we must be bold. I do have three shades of blue, and I do have dark, medium, and light blues; so that works. But what to choose for the second hue family? At this stage in my learning, I have two options: I could choose analogous colors (colors next to blue on the wheel), or I could choose complimentary colors (colors across from blue on the wheel). Analogous colors to blue would be either greens or purples. I have dark/medium/light greens as well as dark/medium/light purples. The greens are not true saturations of each other–the lightest (and brightest!) has a lot more yellow (if it were a saturation, it would have more white); the darkest has more blue (rather than black). The combination of the three to me seems a bit off. The purple combination is much more pleasing. (No, really it is. Really!) I used the dark purple as the background, since it is darker in value than the dark blue I have. For the second variation, I used a hue family complimentary to (across the wheel from) blue–in this case, orange/gold. (I don't have any yellows, which would be the true compliments. Bear with me.) I'll use the same blues; and I'll use a dark/medium/light set of orange/golds. This time, blue will be the background, since it is darker in value than the darkest orange/gold. Both of these variations are rather dark; I think part of this is due to the colors all having a similar value–a similar amount of grey. I also think that the color schemes are a bit limited by only working with two hue families–if I were brave and branched out a bit, then maybe I could add the flashes of color that make Fair Isle designs so very wonderful. For example, what if I started with the purple/blue combination and basing my choices off the foreground color, blue, added an analogous color–bright green? I could also add a narrow line of a complimentary color to the blue–perhaps gold. The first swatch and its chart are the result. Using the same logic, I could add interest to the orange/blue combination. Again basing my choices off the foreground color (orange/gold), I would choose an analogous color (red, since I don't have any yellow) and a complimentary color (a blue/green). 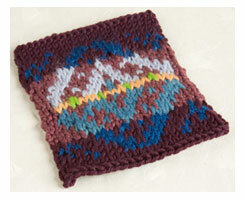 The result is the second swatch and chart. 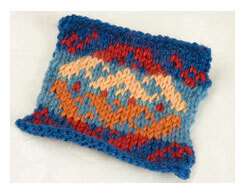 Those additions make the colors start to glow, as they would in a true Fair Isle. I don't think my humble swatches are the right color mixes to make the residents of Fair Isles proud, but you know what? They're a start. I learned more in this one exercise, playing with my little color butterflies and the color information in Color Works, than I've learned in years of knitting and beadwork before this. I'm still not ready to do an entire Venezia of my own, but hey…these swatches would make respectable pockets on a plain cardigan, perhaps! Download the color charts for both swatches!